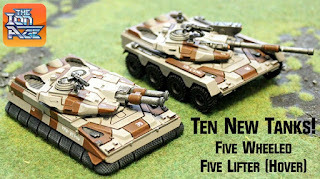 The Ion Age Blog: Ten More Taranis Tanks by Bob Naismith coming in November! Ten More Taranis Tanks by Bob Naismith coming in November! The response to the offers and release of the IAF100 Taranis Tracked Main Battle Tanks designed by Bob Naismith was very good and again we thank you all for that. Five different tracked versions all under the header of the 'Type 40' and while we will be expanding the variants for IAF100 it is the turn of other propulsion methods to take centre stage in November. In fact two new propulsion Taranis types and these will be the Model 6 Wheeled and the Model 9 Lifter (Hover) chassis also designed by the legend himself. A total of ten new vehicles will be added to the range five wheeled and five hover with the same turret and hull options that the tracked propulsion body has. There will of course be full images of each new tank along with pictures of the parts as we did before. There will also be information bursts too. But there will not be a Early Supporter Offer made as these tanks will go straight to release at the price of 18.00GBP each with a saving for purchase of three at the same time of the same type of 10%. This lower price reflects the smaller hull size of these kits compared to the mighty tracked hull. You will also get your Reward Points (some of you have 10,000 plus points saved up and we will be making new rewards availiable next month too) and the monthly free miniatures...something spooky and alien this November for IMP27 (shussh!). 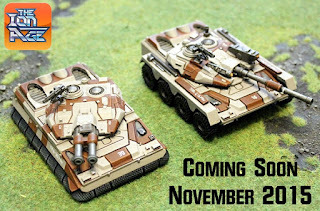 In addition to Bob Naismith's excellent new main battle tanks the other news and miniatures and more during November will be several so keep an eye upon The Ion Age and I hope you like the pictures of the first painted new Taranis! The five variants of Tracked Taranis and the Running Drones will be released on 29th October 2015. That's what I was looking for, wheels. How much smaller are they?